Yesterday the weather was near perfect: the fall air has arrived and the sky was full of wispy white clouds. It was as good a day as one could hope to shoot their first motorcycle video. I had been looking for a subject for several weeks now and a friend had mentioned Manasota Key Road just 40 minutes from my home. He had heard it was a road with a canopy cover most of its length. Certainly worth a look. I left my home at 7:30 a.m. and arrived at Manasota Key Road in 30 minutes. 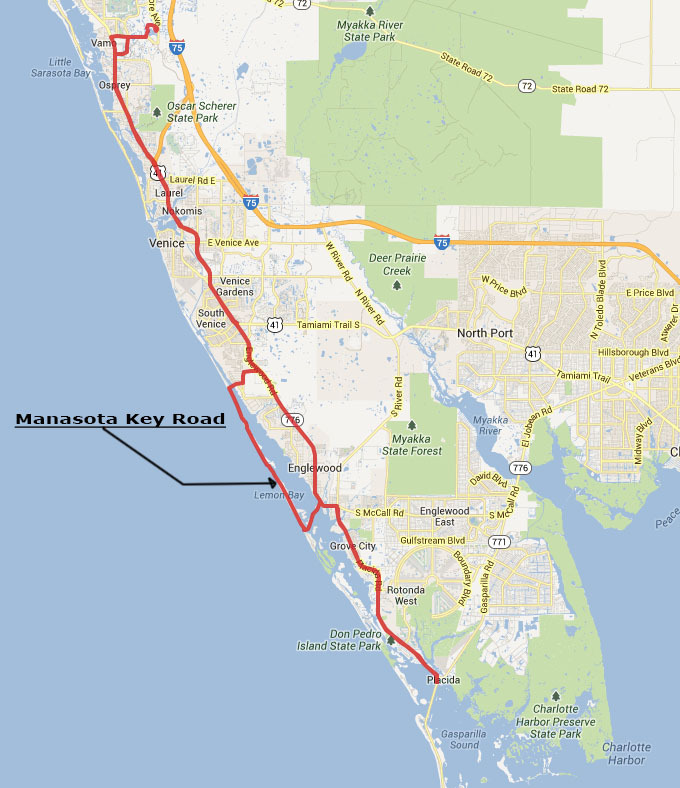 The map shows where the road is situated, between the Gulf of Mexico and Lemon Bay, and my ride to get to it (click on the map for a larger view). I pulled over, turned on the camera, and road a seven mile section of the road at 30 mph, about 15 minutes of ride time. I edited down the raw footage to about six minutes. The motorcycle engine sound, while romantic in some ways, seemed more a distraction than simply setting the clip to music that fit the mood. I choose a Brian Eno track from Ambient 1: Music for Airports (many people know of Brian Eno but not that he is the creator of the start-up sound for Microsoft Windows 95 or considered the founder of Ambient Music during the 1970’s. This is just the tip of his creative iceberg. A remarkable artist, to say the least). The quality could certainly be better: the contrast between the dark road and bright sky was too much for this video camera. Still, it gives you some of the feel for what riding it was like, especially when you add the music. Is video worth pursuing further? I don’t know. We will see. For now as a first video, I can live with it. I hope you find something redeeming in watching it as well. Please feel free to leave your comments as your opinion matters. I rode a bit further down the road but soon started to make my way back home. By now it was 9:00 am and I suddenly began to feel very good, so much so that I started talking and singing to nonsense words with lots of emotion. just like I do with my dogs. I cannot take credit for inventing this, far from it. I am following in the footsteps of the Sound Poets. Sound Poetry is an artistic form bridging literary and musical composition, “verse without words” you might say. Since Sound Poetry is intended primarily for performance, my dogs make the perfect audience. And now so did I, all alone within my helmet. Harry and Simon would be happy to know I was entertaining myself. After 30 minutes of Sound Poetry on the fly, much fun as it was, it was time for some MP3 music. I pulled over and set my Nano to play The Black Keys. For those unfamiliar with the band, The Black Keys is a garage rock band that has been around for over ten years and recently catapulted to fame with their Grammy Awards in 2011, 2012 and 2013. A hell of a band with a hell of sound, perfect energy for motorcycling. My ride ended on just the kind of energy I love at any time, but especially at 60 mph on two wheels. And that was that, a two-hour ride which resulted in my first video, on the fly Sound Poetry, and listening to The Black Keys at 60 mph on two wheels. Isn’t it great when things just turn out so well, especially when you never could have planned a combination quite like this.